A Studio of My Very Own! The studio/office is my most anticipated and daydreamed about room in our new home for obvious reasons. Although the main colors will be the same neutrals found in other rooms of our home, there will be a healthy dose of purple accents throughout the space, including my pretty purple chair I’ve blogged about before. The plans for this space include a wall-length desk down one side of the room with shelves overhead for storage. Something like this. I want enough room for both the hubs and I to have a spot to sit with the printer and Silhouette in between. 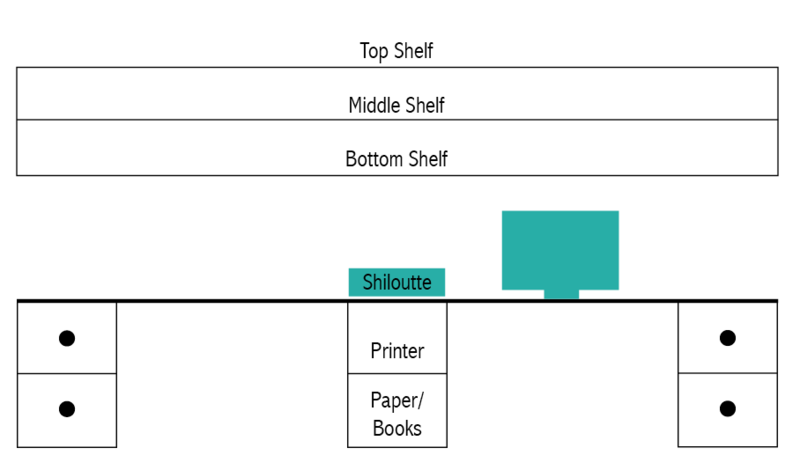 I’d like the printer to live in a cabinet under the desk where we can store paper too. I plan for the Silhouette to be on the desk top where there will be room to feed material into it. Here’s the basic concept, made with two wood file cabinets we got on Craigslist right after moving to the mainland for $25 each and a cabinet we will build to house the printer and support the middle of the desk. Because we have more files than the two cabinets can hold as it is, I might add a file storage bench like this one. It would provide a little bit of extra seating if I have a group of clients and can be moved around as needed or even used as a prop. Luckily hubby uses a laptop that won’t always be on the desk, so that leaves room for me to spread out with craft projects. I’m toying with the idea of adding peg board – likely painted purple – on the wall above the desk but below the shelves for storing things up off the desk, keeping the desktop clear. The other wall will remain mostly bare to accommodate my backdrops for photography sessions. I may eventually add studio lights to my photography arsenal, but for now the natural light from the window will work just fine. I may finish that wall in pallet wood like this, but that would likely be a project much later down the road. I’m on the hunt for a large armoire or hutch for the other corner by the door to house my craft supplies like this. That keeps things behind closed doors, both out of sight and out of reach of any clients’ little hands. I might add something like this to the side of the armoire for a little extra work space when crafting so I’m not always spread out on the desktop. The other option is to create something with storage underneath and above a workspace in the center like this. Large sliding barn doors like these will added at some point to allow us to close off the space when have guests over or I need a little privacy for a boudoir session. They’d double as a nice backdrop if needed too! We will have to figure out a way for the doors to fit past the desk and shelves when open, but that should be simple as leaving a gap between the desk and the wall.